Maybe you’ve noticed that we‘ve been busy little bees expanding our team recently (and if you haven’t, stop what you’re doing and go check our Team page). As with everything we do here at Para-Sols, the quality of our business is always at the forefront of our priorities – this in mind, we knew we needed to create a couple of new job roles in order to improve our efficiency and to support our existing team to truly hone in on their skills and allow them to do their job to their highest ability. Earlier this year we employed two new members of the team, both with very different job titles and very different ways of supporting our office. Just in the (k)Nic of time! As a once much smaller business, but one full of ambition and growing quickly, we soon came to the realisation that we needed an Office Manager, and pronto! We knew that this would come as a huge provision to our team, as the role would take away the pressure of completing the daily office admin tasks that we’d naturally all acquired over time and allow them to focus their efforts on the job in hand. On that note, welcome Nic! 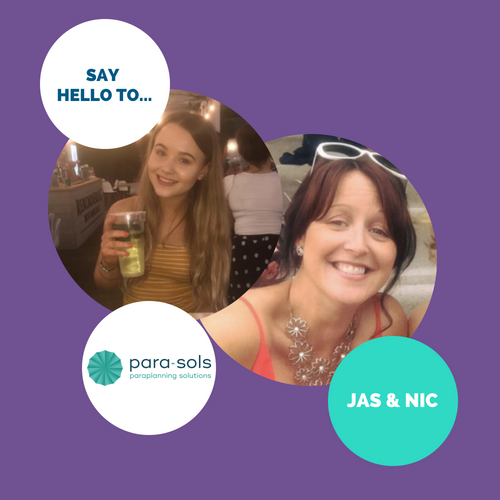 Nic has become a bright light on a dark day for us here at Para-Sols – she has relieved the team of the typical ‘admin jobs’ every busy office creates and although she’s been with us a few months, is already running a tighter ship than we could’ve hoped! We did a quick interview with Nic to see how she’s found the role so far, take a read below. And we didn’t stop there. We’ve also introduced another supporting role in recent months and that’s our new Marketing & Communications Assistant – a role taken on by Jasmine. Jas, as she’s more commonly known, now has daily marketing responsibilities that were previously undertaken by Natalie, giving her more hours in the day to focus on staff engagement, coaching and development and organisational change across the team – absolutely crucial to ensure that as we grow, we don’t lose sight of who we are. Another huge support to the team, this means that Natalie can focus more on her strategic responsibilities assured that the day to day marketing is still in good hands. We asked Jas a few questions on how she’s enjoying her new role – take a read below. Recruiting for two none-directly income generating roles was a considered decision by us. We very much felt that in order to serve our clients with the world-class quality service they deserved and of which we’d become renown for, it was an imperative step within our expansion plans. My first impressions were how relaxed the atmosphere is within the office. I also love The Tunstall Arms, (the pub we have in the office), it’s a really great concept and winding down on a Friday together, really sets you up for a lovely weekend. It’s also really nice to be able to spend some time with my work colleagues in our pub at the end of a week, as you get to know everyone in a different environment but whilst still being in the office. I instantly noticed the positive vibes that people have towards their job – when you walk in, you can just tell that everyone is engrossed in their jobs and really enjoying their work, which is great. I’d previously done 10 years with a local authority so coming here has been a much-needed breath of fresh air! So far, I have learnt how to organise chaos! *laughs nervously*. On a serious note, it’s amazing getting to know a new sector and also a new role. Despite having a lifetime’s worth of customer service, admin and office skills, the role of Office Manager is a new one to me but I’m raring to kick-start my career in a slightly different direction. Because the Office Manager is a brand-new role to the business, it’s meant that I can mould and shape it to put my own mark on things. I’m already building relationships with existing clients by speaking to them regularly over the phone, and really enjoying putting various systems and procedures in place to ensure we run a lean office. It’s an extensive job role and covers a lot of different areas – from all aspects of office management to managing the diaries of the leadership team – so I’m looking forward to exploring all aspects of it and am relishing in the opportunity of making the job my own. This is a fresh approach, clean slate – call it what you will – and the prospect of really making my mark and being able to support an amazing team to be more amazing is what really excites me. The quality of the office that stood out to me the most was definitely the atmosphere. It is noticeable from the moment you walk in and continues to be a focal point the more you are involved in it. In my interview, I had Cedric, (the office dog), bounding over to me and it immediately put me at ease – it’s certainly not your usual office! What has been really great for me is that Para-Sols has completely lived up to my expectations of how it was going to be; after reading the website and getting a feel for things, I thought, “It can’t be that great can it?”, but I can confirm, yes, it is that great! Another attribute that stood out to me from day one, was the team moral. Everyone has each other’s back and it’s so easy to see this when working in the environment. In my first week there was an ‘unofficial’ staff night out, which is always a great way to get to know everyone! I’ve never started a job where you feel like part of the family straight away, yet this is exactly how it has felt here. The support you receive is fantastic, you couldn’t really ask for more. Plus, it’s snacks galore… and as I said earlier, there’s office dogs. I needn’t say much more. In such a short space of time I have already learnt so much about the company and how it is running. My design skills have massively improved and expanded, something that I hope will continue into my career here at Para-Sols. I have found it amazing that I can now use the skills that I gained at uni in everyday life at work, I had always wanted a chance to do this. I have learnt a lot about how the company is ran as a whole and it’s great to work in a place where the staff are so appreciated. Everyone is equal and that’s a really positive quality. The support I have received since starting has been so beneficial – within a few weeks I had been taught how to use the majority of the software tools and systems we use within marketing and given the opportunity to work my way around them, at my own pace. This has been a huge relief, as you never know how fast a workplace expects you to pick things up, but the fact that there has been no pressure in this sense, has made it easier to do so. I am looking forward to embracing more responsibilities as time goes on. It’s so empowering knowing that you work in a place, where a career in what you love, is possible. I’m also looking forward to getting to know the brand at a higher level. I work across both Para-Sols and our sister compliance company Apricity so them, together with The Grad Scheme, I currently have to get to learn 3 brands inside out! Overall, I’d like to expand my knowledge on the whole industry, I am already picking things up across the profession that I wouldn’t have had a clue about previously, which actually, is an unexpected surprise. On a social level, I can’t wait to get to know everyone better. The office is such a friendly place and it really does feel like a family.